Last week Stephen Menendian unveiled an explosive new Doomsday deck. This week he provides a detailed tournament report, including a blow by blow account of battling his way to the Top 8 of the esteemed Waterbury/TMD Open 15 tournament, including an epic match with the legendary Chris Pikula. Stephen goes on to detail lessons learned from his tournament experience, and shares his updated list and ideas for the Maniac Doomsday list going forward for aspiring players looking to pilot this beast in upcoming tournaments! He also presents more detailed information on the notable Mishra’s Workshop matchup, and slight tweaks to give you an edge for your expected metagame. 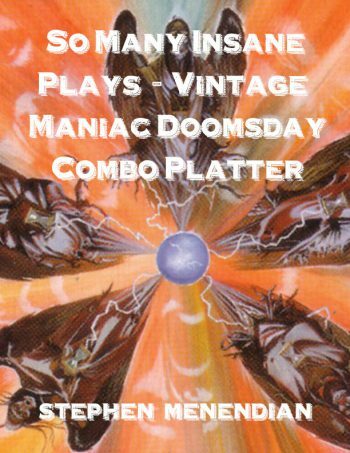 Also, now available, is the So Many Insane Plays – Vintage Maniac Doomsday Combo Platter!